The yellow crazy ant (Anoplolepis gracilipes) is a species of ant, introduced accidentally to northern Australia and Christmas Island in the Indian Ocean, that has caused ecological damage in both locations. It is colloquially called “crazy” because of its erratic movements when disturbed. Its long legs and antennae make it one of the largest invasive ant species in the world. Like several other invasive ants, such as the red imported fire ant (Solenopsis invicta), the big-headed ant (Pheidole megacephala), the little fire ant (Wasmannia auropunctata), and the Argentine ant (Linepithema humile), this is a “tramp ant”, a species that easily becomes established and dominant in new habitat due to traits such as aggression toward other ant species, little aggression toward members of its own species, efficient recruitment, and large colony size. 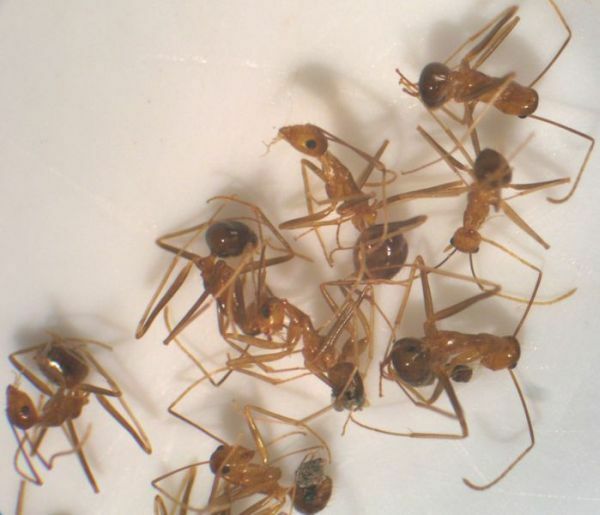 Also known as the long-legged ant or Maldive ant, it is on a list of “One Hundred of the World’s Worst Invasive Alien Species” formulated by the International Union for Conservation of Nature (IUCN). Anoplolepis gracilipes are known to be ready invaders of disturbed habitats such as urban areas, forest edges or agricultural fields. The ability of A. gracilipes to live in human dwellings or human-frequented areas has meant it has become a serious pest in many households and buildings. The yellow crazy ant has been known to successfully colonise a variety of agricultural systems, including cinnamon, citrus and coffee crops and coconut plantations and on banana, rambutan, mango, durian, sugarcane and langsat. In agricultural regions it is typically found nesting at the base, or even in the crown, of crop plants. For example, on New Guinea it nests in the crowns of coconut trees, feeding off honeydew-producing scale insects and palm flower nectar. A. gracilipes is also capable of invading undisturbed habitats as in the case of the drier monsoon forests on Christmas Island (Indian Ocean), where the yellow crazy ant experienced a population explosion and thrives in (previously) undisturbed native forest habitats; it is however not known to enter lowland rainforest or submontane rainforest. The nesting requirements of the ant are general and it often nests under leaf litter or in cracks and crevices. On Christmas Island, the yellow crazy ant takes advantage of crab burrows, the woody debris of the forest floor, tree hollows and epiphytes and the hollows created at the base of palm leaves.